I’d like to start with a little anecdote of something that I came across a few months ago. I got an Uber – it was fairly late at night and I’d been out with a friend. We’d been drinking and vaping. He said “Oh, I’ve been vaping too, I’ve got an e-cigarette” I said “Oh, that’s interesting, what have you got, let’s see it?”. He said “Oh no, I don’t bring it out with me, I don’t bring it to work.” I said “Whyever not?”. He said “Well, Transport for London have banned vaping in private hire vehicles so I can’t use it and it’s too much of a temptation.” And I said “So, what do you do, when you go on a shift?”. And he said “Well, I always buy a packet of cigarettes before I start work”. The European Commission is holding a public consultation into the taxation of tobacco and vaping products, ending on 3rd September (1). Consumer associations and tobacco harm reduction organizations are issuing an urgent call for mobilization. Answer the questionnaire >> Public consultation on excise duties applied to manufactured tobacco and the possible taxation of novel products. A tobacco treatment specialist has advised frontline workers to help their clients quit smoking and withdraw from their use of other drugs at the same time. Historically, frontline workers have not always encouraged clients to simultaneously withdraw from tobacco and other drugs. The belief was that trying to stop tobacco use might interfere with the process of withdrawing from a primary drug of dependence. Tell the FDA You’re Not An Anecdote! A recent paper in BMJ Open claims to show that smokers’ use of vapor products to partially replace smoking does not result in lower per-day cigarette consumption. This conclusion is a ridiculous stretch based on bad study methods, but it is being adopted as yet another point of attack by anti-vaping activists whose second-favorite message (after “think of the children”) is to claim that vaping just keeps people smoking. The paper, “Is prevalence of e-cigarette and nicotine replacement therapy use among smokers associated with average cigarette consumption in England? After a smoking ban in British prisons last year led to riots, the Ministry of Justice allowed prisoners to vape. The program has been a big success, with 33,000 inmates now buying e-cigarettes in prison. The smoking ban caused havoc in the prisons — not surprising considering 80 percent of the U.K.’s prisoners smoked. Violence among inmates and assaults on guards had increased, according to Metro.co.uk. Some smoking prisoners even tried to smoke nicotine patches. In 2017, efforts to implement a smoking ban in UK prisons, led to a series of riots. This ban had been introduced over a decade ago, but never enforced up until last year. However, Several prison reform organizations had come forward voicing concerns about how such a ban could lead to violence and contraband trade activities. “A sensible and considered approach to smoking in prisons would leave prisoners with a choice – at least to smoke outside,” said Director of the Prison Reform Trust Peter Dawson at the time. The Western Trust has strengthened its strict no smoking policy to include no vaping on its grounds. Staff are being warned that they may face disciplinary action if they fail to stick to the rules. Staff have been directed to ask carers and service users who smoke, to refrain from doing so an hour before any scheduled visit and while they are there. Dessie Lowry of the Royal College of Nursing described the threat of disciplinary action as “draconian”. Rethinking nicotine: Where to next? French may be the language of love, but the country is currently experiencing more of a love-hate relationship with electronic cigarettes in the quest to cut smoking numbers. At the end of May, France announced a huge reduction in the number of smokers in 2017 – a major public health victory for a country well-known for its love affair with cigarettes. Around one million smokers have stubbed out their cigarettes for good according Public Health France – a drop the size of which has not been seen in a decade. India has a cohort of doctors who are going on record to say how dangerous vaping is. Politicians in Tamil Nadu used this as justification for an idiotic ban, and the national government plans on copying the measures according to harm reduction advocates. The Association of Vapers India responds. The vaping industry is rallying former smokers who quit using an electronic cigarette to share their stories with federal regulators, who are mulling restrictions on flavored products. The advocacy campaign, dubbed #Fight4Flavor, comes in response to a proposed rule from the Food and Drug Administration to regulate tobacco and nicotine flavoring, something users and harm reduction experts fear is a veiled attempt to cripple the market for alternative products and technologies. The number of fire accidents caused by discarded cigarettes in May 2018 decreased on-year possibly due to the growing adoption of heat-not-burn cigarettes. The National Fire Agency cited the growing popularity of heat-not-burn cigarettes as one of the reasons behind the fall. Data from the agency showed that fire accidents caused by discarded cigarettes dropped from 6,861 in May 2017 to 5,846 in May this year, marking a 14.8 percent drop. The Health Ministry has reportedly banned importing the Juul electronic cigarette, after Deputy Health Minister Yakov Litzman (United Torah Judaism) determined that the company’s e-cigarettes contain too much tobacco, Kikar Hashabbat claimed. Haaretz noted that Juul, for its part, has threatened to take legal action, since the Health Ministry is not banning all e-cigarettes. Myth. Big Tobacco controls the #vaping market. Fact. Big Tobacco has no more than 12% of the US vaping market. #Juul now has 70% of the sale value of cigalikes and pods. Big Tobacco sell almost no tanks or mods. You might travel a lot as part of your job. Or when you are working hard, your thoughts might be turning to taking a well-deserved vacation as summer approaches. If you are feeling virtuous having switched the cigarettes for vaping, you might not even give it a second thought as you put your vaping kit in your purse instead of the cigarettes. There’s more bad financial news for IQOS as analysts say it won’t replace tobacco income. Milwaukee politicians are trying to help Philip Morris as best they can with a vape ban. A woman is happy to sue for cash because she misused a “vape pen”. This isn’t the benefit a think tank had in mind when demanding reforms to UK vape laws to benefit women. A Cornish vape shop owner quits the game and mines for gold. In 2007, a staff member at Puddlecote Inc who smokes commented on the inception of the smoking ban by saying “ASH may as well pack up now, they have everything they want”. I replied that they will never stop because if they did it would threaten the most precious thing to them … their salary. E-cigarettes. A threat or an opportunity? Colin gave a presentation to The Sydney Institute last night on electronic cigarettes. 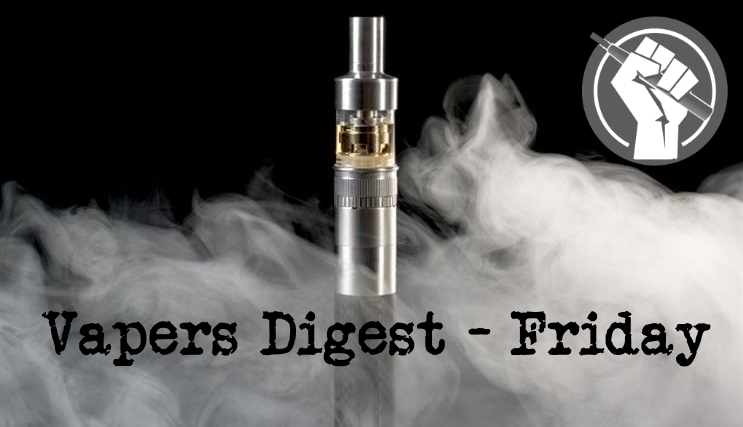 The presentation discusses the evidence for vaping, the arguments against their use and tries to explain why experts can’t agree on the subject. Finally, there are recommendations on policy and regulation.